We offer scheduled public training courses on a regular basis at various locations across the UK. These include: Billingshurst in West Sussex and Newark-on-Trent in Nottinghamshire. Each training classroom can accommodate up to six delegates and includes all the necessary training material, including modern computers and software. The cost of the course also includes lunch and refreshments throughout the duration of the course. Training in smaller classes means everyone can learn at their own speed with individual attention if needed. Learning in person rather than following videos online or reading articles is undoubtedly the best way to learn about CAD and BIM, especially when you plan to use your software skills for commercial and professional use. 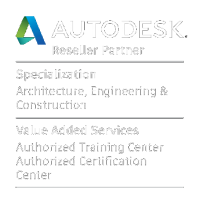 Plus, at the end of any Autodesk course with us you will receive an official Autodesk certificate. You can also rest assured knowing that we are an Authorised Autodesk Training and Certification Centre. We regularly offer public courses on industry specific topics such as Revit Family Content Creation and Revit MEP led by experts in the field. If you would prefer to run one of these training courses at your premises, that can also be catered for too! Our team of professional tutors will be more than happy to come to your office to offer in person tuition and specialised classes that can give you and your team the best environment to work on specific tasks and ask questions. This type of training is also great if you would like to work on more advanced tasks or if you have a new employee and would like to get them up to speed with the software. If you would like to know more please call us on 01403 784139 or head to our contact page.